Single Gable Ended Roof "KENT"
Double Garage Gable Ended Roof "SUSSEX"
Triple Garage Gable Ended Roof "SURREY"
Single Garage Gable Ended Roof With Catslide "OXFORDSHIRE"
Double Garage Gable Ended Roof With Catslide "BERKSHIRE"
Triple Garage Gable Ended Roof With Catslide "HAMPSHIRE"
Single Garage Hipped Roof "YORKSHIRE"
Double Garage Hipped Roof "CUMBRIA"
Triple Garage Hipped Roof "NORTHUMBERLAND"
Single Garage Hipped Roof With Catslide "CAMBRIDGESHIRE"
Double Garage Hipped Roof With Catslide "HERTFORDSHIRE"
Triple Garage Hipped Roof With Catslide "BUCKINGHAMSHIRE"
Single Garage Hipped Roof With Catslide And Single Logstore "GLOUCESTERSHIRE"
Double Garage Hipped Roof With Catslide And Double Logstore "WORCESTERSHIRE"
Triple Garage Hipped Roof With Catslide And Double Logstore "STAFFORDSHIRE"
2D and 3D Drawings and Images are only intended to be indicative. We have a policy of constant product improvement, the frame which is delivered may deviate slightly from the dimensions and layout shown. If you are interested in ordering this oak frame, head over to our contact page and fill out the enquiry form. 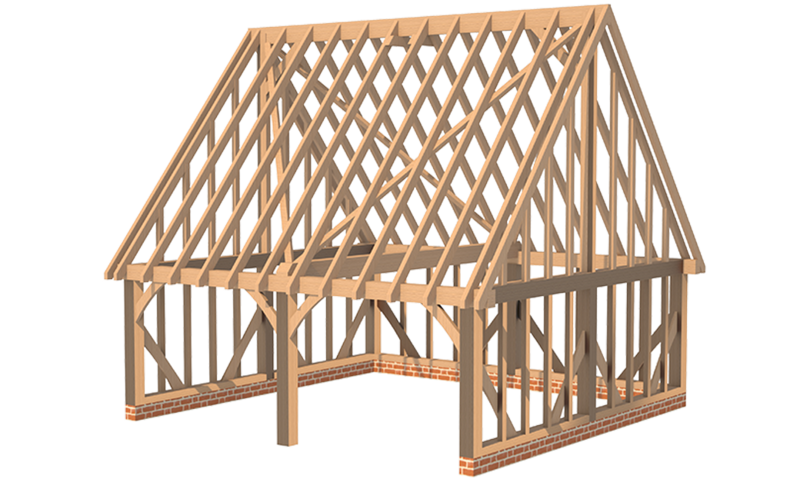 This Oak framed structure is constructed using 100% European green Oak, this includes the rafters, studs, posts, beams and braces. Every component in this structure is Oak unlike many other similar products that are offered on the market today, many of which use softwood components through out. As with all of our Oak structures there are many options and the building can be extended to incorporate multiple bays with additional features such as garage doors, windows, personnel doors and log stores. All of our oak frames are fully planed and traditionally jointed to make the construction of the oak frame as easy as possible. Built to the high standards you would expect from Greenacre Oak, the building is of a traditional oak framed design that provides a cost effective solution and yet still giving you the charm that a traditional oak building has. Oak framed buildings are enjoying a revival and Greenacre Oak are leading the way by combining the highest quality craftsmanship with stunning contemporary design. Southbourne, Colchester Road, Chappel, Essex. C06 2DQ. © copyright Greenacre Oak. 2017. All Rights Reserved.